Our good friends over at So Eventful generously participated in the annual Festa Della Donna fundraiser. Festa Della Donna is an annual spring event hosted by a committee of supportive and beautiful women in the Lodi community. The event celebrates the independence of women from unjust labor and oppression. This year, the event raised $109,000 for Lodi House and Hope Harbor at the Salvation Army. Every year, hundreds of people volunteer to run the event. This year, there were more than 30 individually decorated tables by both professional and amateur decorators. 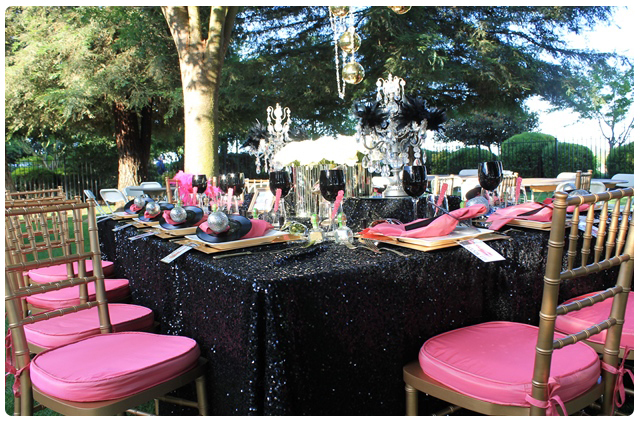 So Eventful decided to go with a unique and bright “Glam Rock” tablescape for the event.. let’s take a look at how it turned out. For this design, Marissa at So Eventful used a King’s table, which is an 8ft long and extra wide table, the perfect canvas that gave lots of space for the guests and the decorations. 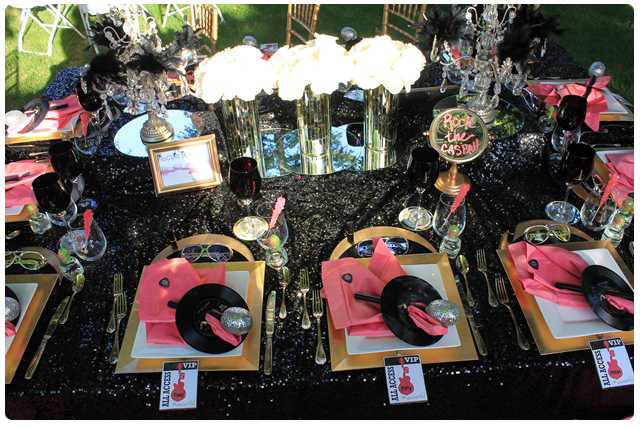 Marissa went with black sequined linens that screamed rocker glam! 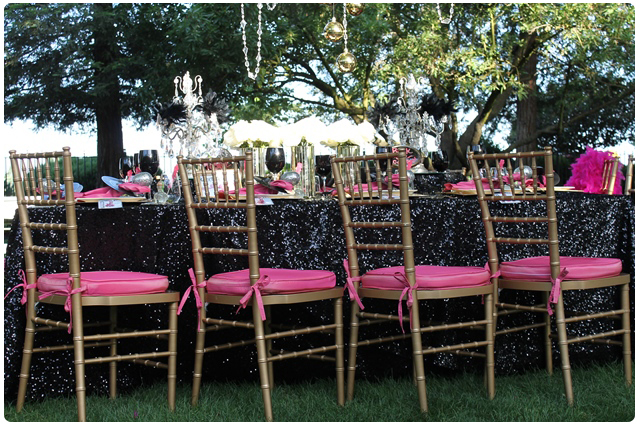 Bright fuchsia pink cushions rested on our gold Chiavari chairs. 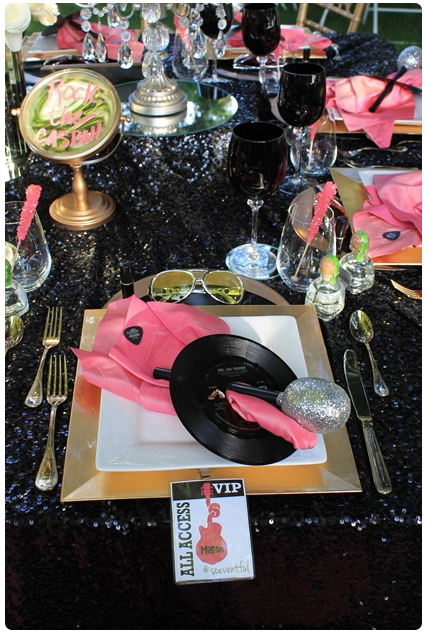 Each place setting was decorated with gold square chargers, square plates, and fuchsia napkins. Marissa designed her own napkin rings made from old 45’s and microphones. A super cute idea! Can you see the mini Patrón bottles that were given as favors? She also showed off our new gold Savoy flatware. 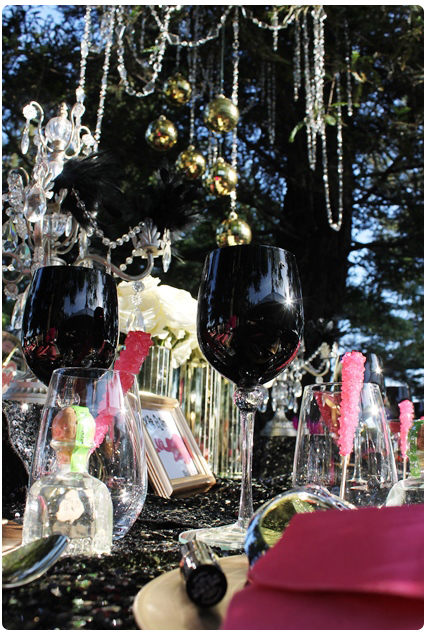 She used our new black wine glasses and placed pink rock candy in our stem-less glasses for extra color. 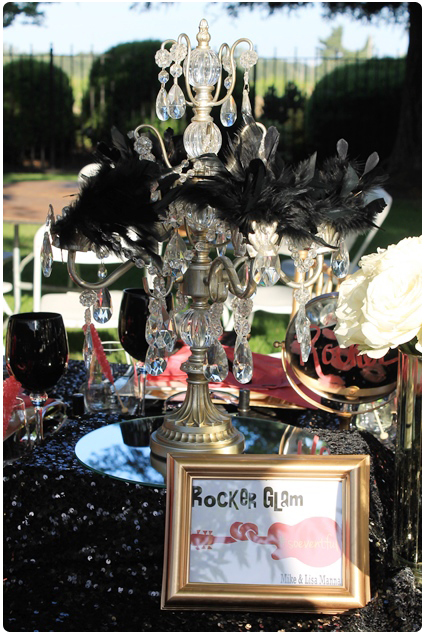 The centerpiece was a custom-made candelabra adorned with glam black feathers and lots of jewels. 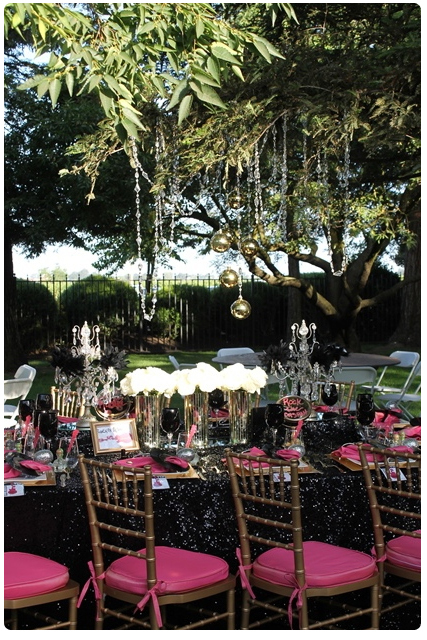 And to complete the glam rock table design, Marissa hung crystals and diamonds from the trees above the table. This was a fantastic event and for a great cause. We can’t wait to attend next year’s event.